Easter is a time for family gatherings, Easter egg hunts, vibrant colours, and of course delicious food. But if you’re anything like us, then you know the old saying “first we eat with our eyes” rings oh-so-true. The five tablescapes showcased below provide a visual feast that more than satisfies our appetite for festive table-top decor and is sure to have your guests drooling well before the lamb roast even hits the table. Brass and Marble and Peonies…Oh My! 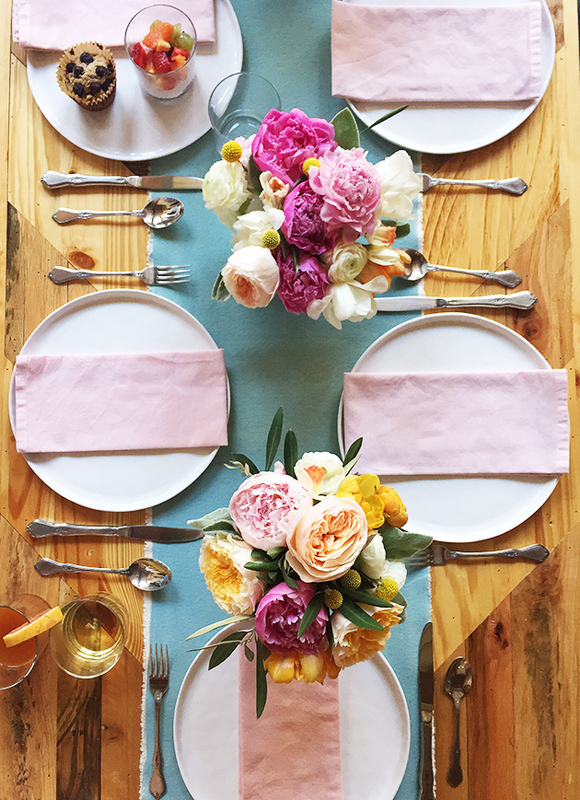 We might have died and gone to tablescape heaven with this spread. Everything about it is luxe. But what we love best is that designer Emily Henderson hasn’t restricted the beautiful pastel colours associated with Easter celebrations to just flowers and linens. 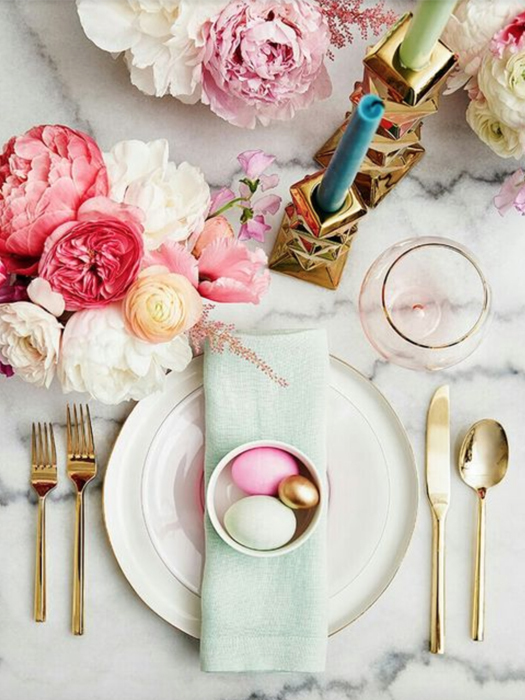 Don’t be afraid to incorporate coloured tapered candles and even chicly dyed Easter eggs into the mix. Bonus points for a golden egg. If avoiding hot topics like politics is one surefire way to guarantee your gathering goes off without a hitch, then the other is keeping overbearing plant life at bay. It’s important to remember to keep your flowers below eye level to ensure the conversation continues to flow throughout the meal. 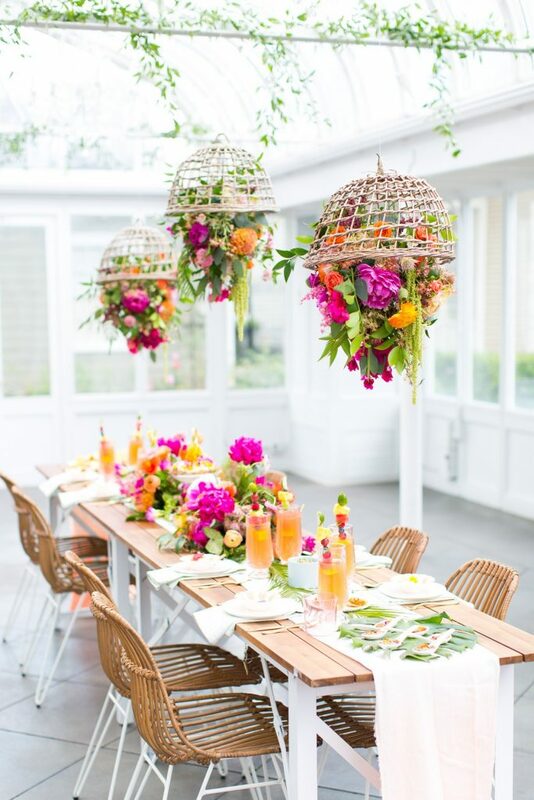 Sugar and Cloth nailed the look with their hanging upside down flower basket concept. You can read their tips for creating your own here. For something sophisticated and chic, just a single leafy branch accompanied by a few scattered candles can be a simple and affordable solution to a table runner. 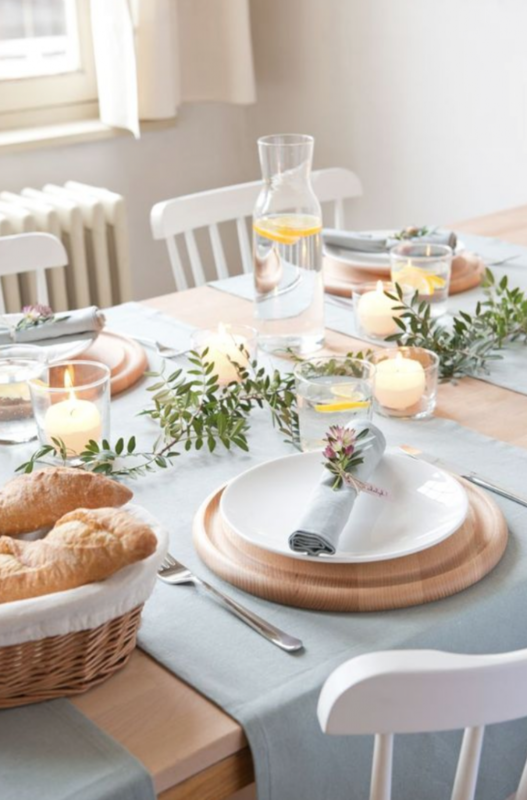 Just add some very #ontrend timber place settings and a muted tablecloth and you have an Easter brunch fit for Scandinavian royalty. We all love fresh flowers but every once in a while a good imposter can give the real thing a run for its money. These paper flowers scattered in eclectic vases are a great example. 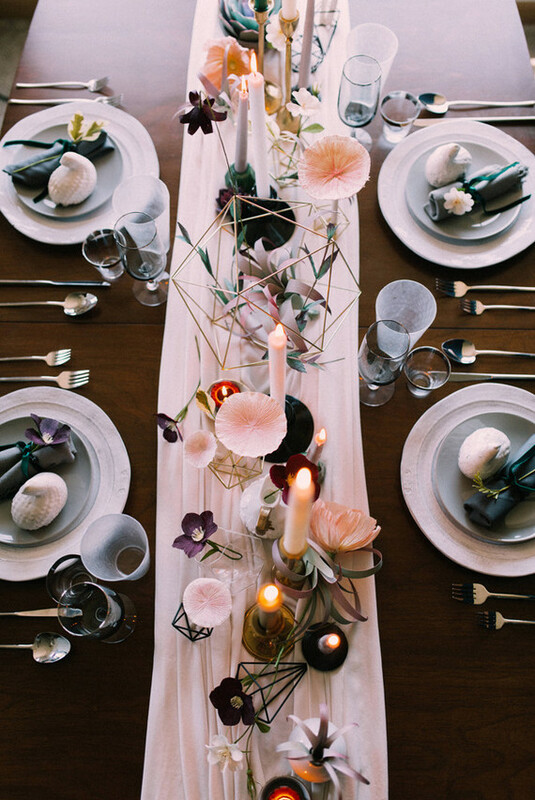 This look, created by The Cobra Lily and creative director Brynn of Dandy & Fine Parties for 100 Layer Cake strikes an incredible balance of simple elegance mixed with bohemian refinement. But if making paper flowers isn’t your thing, or you’re just too time-poor for that kind of craftiness, then you can always leave it to the experts at Pink Cherry Mama to make some for you. After all, when your flowers last years rather than weeks, we’d say these little guys might just beat the real thing. It’s not every day we see a timber table with so much natural beauty, but if you’re lucky enough to own one, by all means, show it off! A simple runner punctuated by gorgeous flowers allows the character of the wood to shine through, and the organic plates flanked by charming flatware makes us feel like we could spend hours drinking Rosé at this table. This look lends itself to mixing and matching with glorious perfection. We could see mis-matched chairs and multi-patterned china and even pastel coloured glassware feeling right at home here. So if you’ve got it, definitely flaunt it. Read more on this Easters hero colour Ruby Red.